Halong Bay holidays are becoming extremely popular and not without due cause. Exploring the Hidden Halong Bay may not be the easiest thing to do, but it is so worth the effort. The Bay is a 600 square mile UNESCO World Heritage site in the Gulf of Tonkin 100 miles from the Capital of Vietnam, Hanoi. It has almost 2,000 small limestone islands called karsts that shoot out of the water and tower above the hundreds of cruise boats that sail here. Most of the organised tours follow a well beaten path. 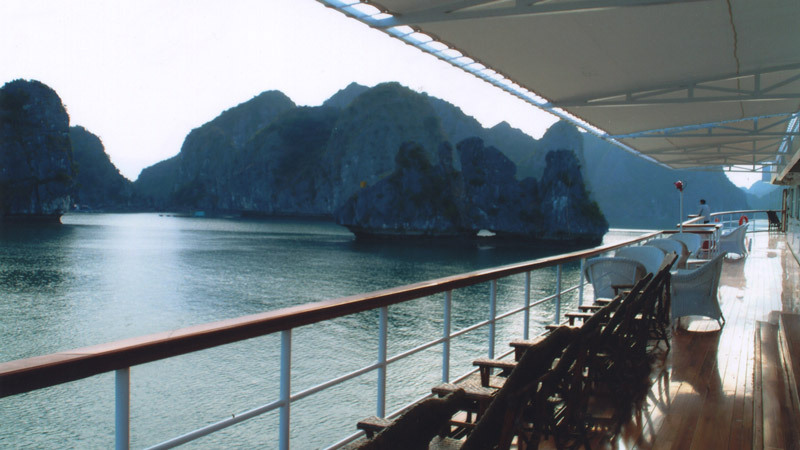 Most cruises in Halong Bay take in the same attractions and follow a similar route. If you try though, you can get away from the masses and do your own thing, finding something of the hidden Halong Bay as you go. Probably the best way of really discovering what the area has to offer is to charter your own Halong Bay cruise boat. Obviously more expensive than joining a standard cruise boat, it can still be reasonably priced and the rewards can be very high indeed. Once hired you can request that the captain deviates from the normal route, and weather permitting he will oblige. One such company, Halong Bay Junk Boat, has one and two cabin options, on delightful old style sailing junks. At least one of the Halong Bay cruise companies, Indochina Junk offers a spectacular three day cruise on their old junk style cruise boat that includes a special candlelit dinner INSIDE one of the marvellous caves in the bay. This is an opportunity not to be missed whilst enjoying your Halong Bay holiday. The cave is both mysterious and fascinating, eating dinner inside is extremely special; ideal for a romantic meal or to celebrate a special event. A rarely visited island, Dau Be is small at almost 23,000 square metres, but has some remarkable features. It is only half a kilometre from Hang Trai Island and just 28 km from the tourist wharf at Bai Chay. 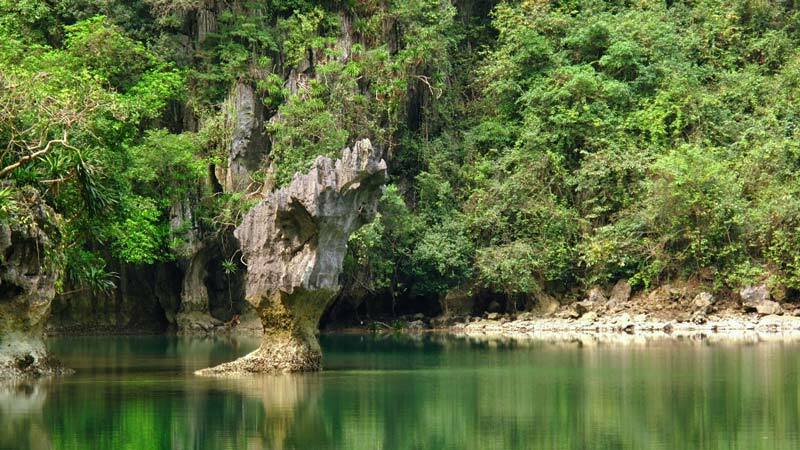 The highest point of this karst is 139 metres as it rises imperiously out of the dark blue waters of Halong Bay. It is mainly known though, for the Ba Ham Lake. This is a lake system that has three round lakes linked by a narrow meandering tunnel. The stalactites in the tunnel are impressive and many coloured. This is definitely worth including on your Halong Bay holiday. It is incredibly tranquil to row through this tunnel visiting each of the lakes. The island has abundant plant life such as orchids, banyan trees, Benjamin Figs and Cyads, whilst it also hosts the yellow-haired monkey. Sea life is also here in abundance. Dau Be is certainly one of the secrets of the hidden Halong bay. As mentioned earlier the vast majority of the Cruise boats in Halong Bay follow a similar route. This enables them to take their charges to all the attractions and has the added bonus of mooring in the same bay as night falls; safety in numbers. If you try though you can find boats that will chart a different course and you’ll get the solace that you desire. One such route takes you Bai Tu Long Bay and total tranquility and solitude. This bay lies to the East of the main part of the area. Treasure Junk is a traditional wooden junk style sailing boat with strong ethical and ecological values, that does exactly this. Hidden away on the Eastern side of Cat Ba Island is a small nature-based resort called Whisper Nature. Merely getting here becomes part of the adventure. You can either cycle or hire a motorbike and ride to Viet Hai where the bungalows are situated. It’s a simple place in an idyllic location. This is an ideal location from which to try and spot the elusive and endangered Cat Ba Langur. So enjoy your holiday in Halong Bay whatever you decide on. If you are happy to just go with the flow, then fine. However if you really want to see something of the hidden Halong Bay, these tips will help you achieve that. Halong Bay, or Descending Dragon Bay, is a UNESCO World Heritage Site and a popular travel destination along the coast 170km east of Hanoi. The Bay features thousands of limestone karsts and isles dotted with caves and grottos. Halong Bay occupies 1553 square kilometres and includes 1960 islets, most made of limestone. A fine example of aging with grace, the bay has been in geological transformation for 500 million years and was once called the “rock wonder in the sky” by poet Nguyen Trai in his verse Lo Nhap Van Don. The geodiversity of the environment has created an incredible range of natural wonders spread over tropical evergreen, oceanic and sea shore ecosystems. While tourism and industry have taken a toll on the ecology, constant efforts to practise sustainable tourism ensure that visitors will continue to enjoy this natural wonder in a responsible manner. Local people employed in the tourism and souvenir industries are encouraged to be mindful that they are working in a fragile environment. New developments must not be allowed to compromise this. After enjoying the above ground wonders, step into another world through the expansive caves dotted throughout the islets. Each cavern contains jagged stalactites and stalagmites in a vast spectrum of shapes, all open to imaginative interpretation. Halong Bay has also been the setting of two James Bond films. Though it may be difficult to imagine a speedboat chase through such serenity, how can you blame the filmmakers for taking advantage of the cinematic scenery? Halong Bay is the jewel in Vietnam’s crown. There are many amazing scenic places in the country, and Halong Bay takes the top spot. It is an astonishing place of special historical, cultural and scientific interest. Covering 600 square miles it contains at least 1,960 islands, ranging from tiny islets to large well inhabited ones. Five hundred million years in the making, the islands take the form of limestone karsts that jut imperiously out of the Gulf of Tonkin, 100 miles to the east of the country’s capital, Hanoi. Listed as a UNESCO World Heritage site in 1994, it achieved further recognition in 2000 when the World Heritage Committee recognised the bay for its outstanding geological and geomorphological value. In 2012 The New 7 Wonders Foundation named it as one of The Seven Natural Wonders of the World. Sadly it has to be said that tourism is having a negative effect on the bay. The waters in some of the busiest spots are polluted with diesel spill and rubbish. It is something that needs addressing. Halong Bay means “The Bay of the Descending Dragon”. Local legend tells of a time early in Vietnam’s development when it was trying to fight off invaders. The gods sent a family of dragons to protect the local people. The dragons spat out jade and other jewels which turned into the islands. The islands attacked the invaders sinking their ships. The dragons decided to live in the bay and descended into the waters. This really is one of the most scenically stunning places on earth. Everyone will have their own reasons for visiting Halong Bay, here are just some of the best ones. The only way to see Halong Bay of course is on the water. There are hundreds of tour boats plying their trade here now. Most of the boats are extremely well equipped, well run and offer sumptuous accommodation and superb dining. It is a lovely way to spend a few days. Sitting on the deck, drinking a cocktail while the boat slips between the amazing rock karsts as the sun goes down is one of life’s truly great experiences. Whilst enjoying your holiday in Halong Bay on your cruise boat, take the opportunity to rise early. The boats often have Thai Chi lessons at 6 a.m., but even if you don’t want to take part, get out of bed and enjoy the spectacular early morning view. More often than not the mornings in Halong Bay are shrouded in mist, so much so that you can be moored just a few feet from a giant karst but may not know it. As the mist starts to clear the islands loom eerily into view. Cat Ba Island is the largest island in the whole of the bay. It covers 100 square miles. It is part of the Cat Ba Archipelago, which comprises of 366 islands to the southeast of Halong Bay. Half of the island is given over to the Cat Ba National Park, home to an abundance of flora and fauna. 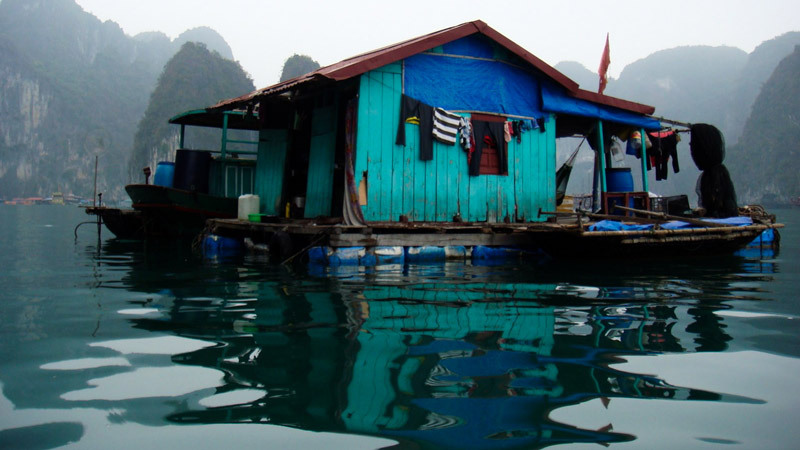 Cat Ba is also home to 13,000 residents on land and a further 4,000 living in floating villages just off the coast. Amongst the amazing wildlife here is the Cat Ba Langur. This delightful primate is one of the most endangered species in the world. A colony that used to be 2,700 strong was down to a mere 53 animals by the year 2000. Careful monitoring by various protection agencies numbers have risen to about 70 animals (as of April 2015), but it remains severely at risk. The floating villages of Halong Bay are a throwback to a time centuries ago. People have lived lives unchanged for generations here. Children learn to swim before they can walk and in many cases have their own small boats by the age of four. The houseboats that make up the villages are all fastened together to form the community. In addition to dwellings there are schools, shops, a community centre and a police station. Also in the Cat Ba Archipelago just off the main island is Monkey Island, a privately owned island with one of the best beaches in the bay. The resort here caters for all tastes and offers swimming, kayaking, football, volleyball and billiards. Most people though, tend to just hit the gorgeous beach and relax. 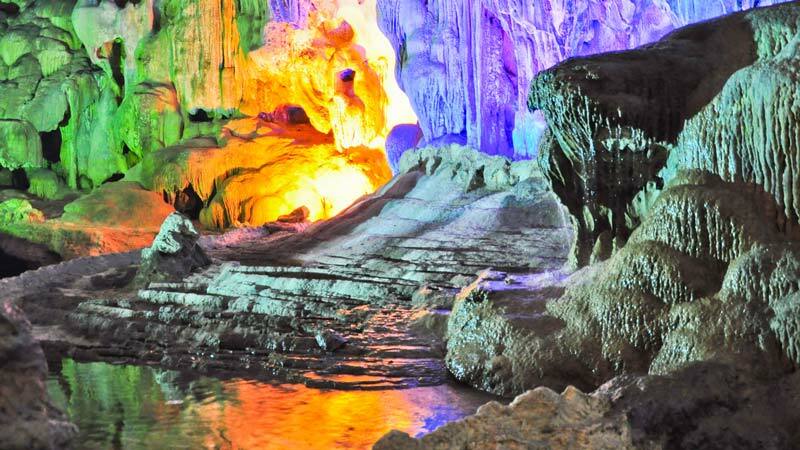 Sung Sot or the Surprise Cave is situated on Bo Hon Island. The entrance is 25 metres above the water, but the climb is well worth it. This is a huge cave by any measure, it covers 12,200 square metres and the ceiling, at its highest, is over 30 metres. Enormous stalagmites, stalactites and columns impress. The guides go to great pains to point out the resemblance of every rock to a horse, a lion or an elephant. Some of these are tenuous to say the least but it all adds to the fun. The cave is artificially lit in different colours as is the Vietnamese want, but in this case it works pretty well. If late night drinking parties are your thing, this is the place for you. The island has become the one place in Halong Bay that isn’t about tranquility and natural beauty. Booze cruise boats pull in here packed with young backpackers who spend the day rock climbing, tubing and kayaking and the night drinking and annoying anyone who isn’t part of the group. The trips here do not come cheap and the reviews consistently mention rude staff. Pearl farms are developing swiftly here as the local people search for alternative economic opportunities. The Cruise boats in Halong Bay stop off so passengers can see the fascinating work of the technicians who culture the pearls. It makes for an interesting hour or so and then you get the chance to purchase pearls at a discounted rate. The farms themselves are out in the bay with the technical workshops and salesrooms all floating on the water. 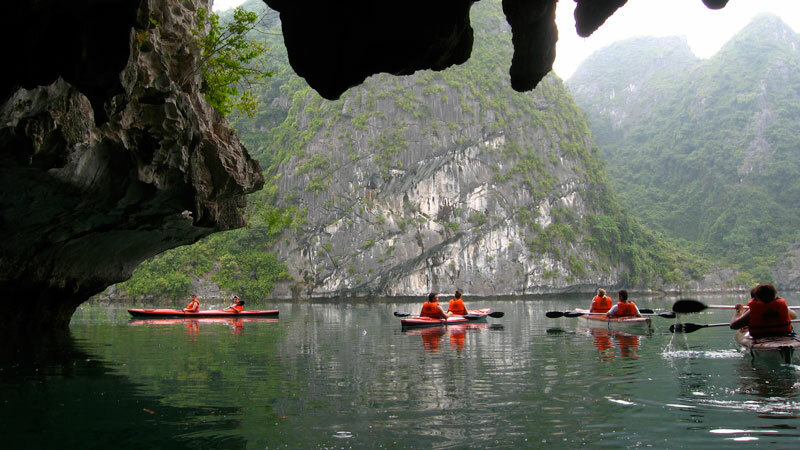 Virtually all the Halong Bay cruises offer the chance to do some kayaking. This really is fun for all ages. Guides show you the way to go and you get to enter some of the hidden lagoons through small tunnels. It’s great fun amidst amazing scenery. It’s all done at a leisurely pace and is well worth the effort. Whatever you do in Vietnam you should not pass up on the chance to visit this truly awesome wonder of nature. It is special, of that there is no doubt. From its early development all those millions of years ago to its demise at some point in the future, Halong Bay is undertaking of a journey of its own. We are here at precisely the right moment in time to enjoy it at its peak. Want to read more from this author? Keith is a travelling writer and lover of all things Southeast Asian. Check out his other articles for more of his travelling tales. Cat Ba Island is the largest island in the UNESCO World Heritage that is known locally as Halong Bay, The Bay of Descending Dragons. Cat Ba is large at around 110 square miles. Fifty percent of the island is given over to the Cat Ba National Park; an astonishing natural resource that contains extremely important species of flora and fauna. The island has a large indigenous population split about 75% on land and 25% in floating villages around the coast. It sits in the Southwestern part of Halong Bay, just about due East of Hai Phong from where ferry services operate. Whilst enjoying your holiday in Vietnam, be sure to take in Halong Bay and whilst doing so, check out Cat Ba Island. Cat Ba Island is one of the few populated islands of Halong Bay. It maintains a population of 13,000 who live in six different communes, they are, namely: Hien Hao, Gia Luan, Tran Chau, Phu Long, Wuan Dam and Viet Hai. A further 4,000 more inhabitants live in floating fishing villages off the coast. The people are mainly of the Kinh ethnic group. The large majority of the population can be found in Cat Ba town, which is at the southern tip of the island. They make a living from fishing and tourism. The annual average temperature on the island falls between 23ºC and 24ºC. Whilst rainfall is from 1,700 to 1,800 mm per year. The main part of the rainy season is in July and August. Probably the best time to visit the Cat Ba is between late September and November, when the air temperature is mild and sky is clear. At this time the island has pleasant weather for either enjoying the beaches or walking. 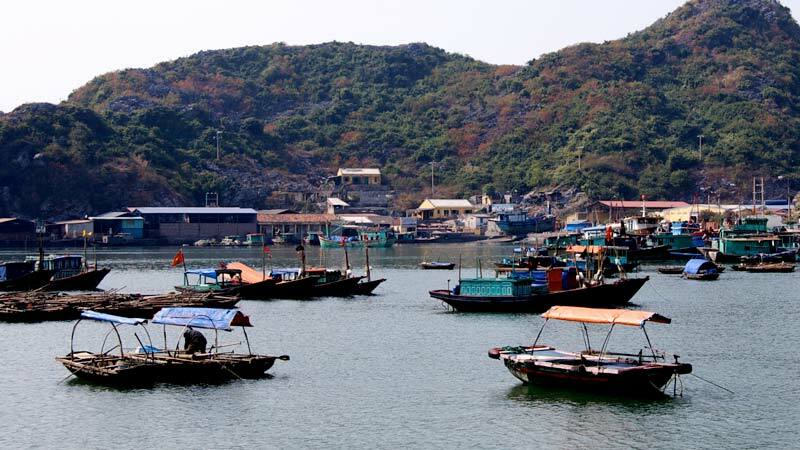 The entire centre of the island, representing about 50% of the total land area, is given over to the Cat Ba National Park, administered by Hai Phong. It comprises 67 square miles of land and about 35 square miles of inshore sea. It was established in 1986 by the government of Vietnam. It consists of marine ecosystems, terrestrial forest and mangroves. The park is truly amazing and contains many indigenous mammals such as Langurs (including the Cat Ba Langur - see below), macaques, civets, wild boar, wild deer and squirrels including The Giant Black Squirrel. A varied bird population has hornbills, various hawks, cuckoos and many other songbirds. There are over a thousand plant species that have been identified including 118 species of tree, such as the amazing mangroves. They have also identified 160 plants that have medicinal values. 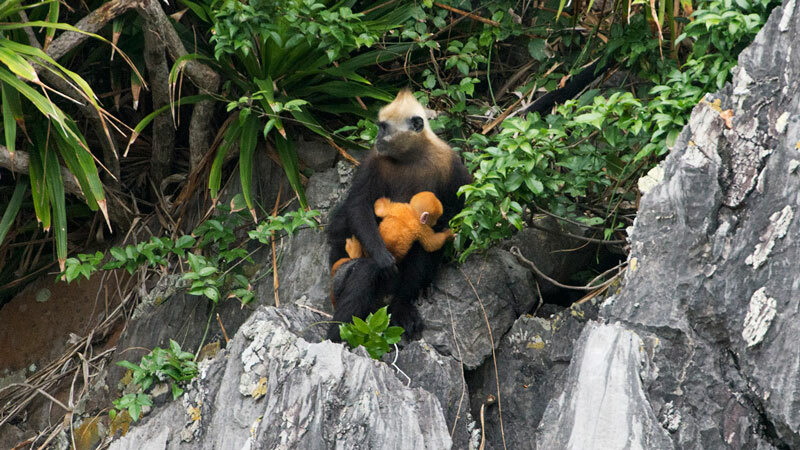 This beautiful golden headed langur is the world’s second most endangered primate, is the most endangered in Vietnam. From an initial population of around 2,700, human intervention, mainly in the form of poaching, saw their numbers drop to just 53 by the year 2000. Then, Münster Zoo and the Zoological Society for the Conservation of Species and Populations (ZGAP) formed a partnership with various Vietnamese conservation agencies, to create the Cat Ba Langur Conservation Project. Thankfully since then, langur poaching has been brought under control. There are now estimated to be about 70 (as of April 2015) individuals in the park. It is a move in the right direction but they still have a long way to go. There is much to see and do whilst on holiday in Vietnam. 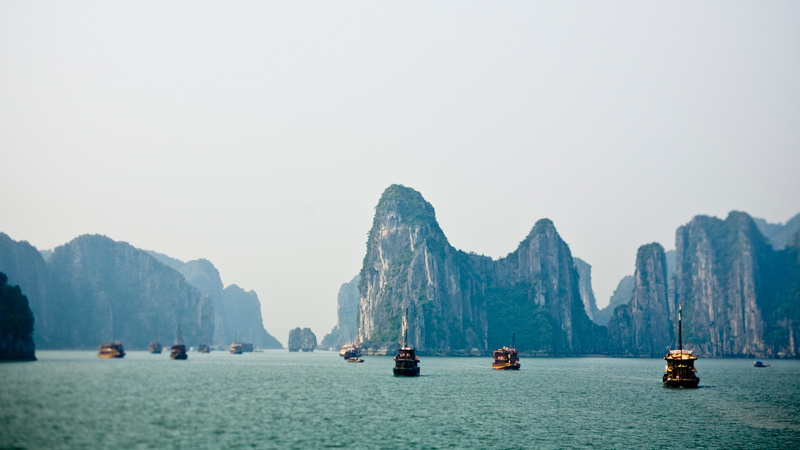 a Halong Bay cruise should be one thing not to be missed. Whilst doing so, drop in to Cat Ba Island and see one of the most amazing places in the country. This article is based on an interview between Patrick Gaveau and Cao Son, CEO of Paradise Group, one of the biggest cruise operators in Ha Long Bay since 2008. In 2008, the market was not as positive as I expected, said Mr Cao Son. The destination itself was not well known back then. As I travelled to many countries, in some countries they didn’t know about Ha Long Bay. This was due to a lack of promotion and marketing for the destination. Once people came to Ha Long Bay they would love it but many people in the world did not know where it was. We tried to promote not only our cruise but the destination as well, but there was a need for a concerted effort from the local authority and the Vietnamese government to promote Ha Long Bay. Many people who come to Vietnam only choose one destination out of many possible destinations, so promoting Ha Long Bay means promoting Vietnam, and vice versa. Today the number of tourists coming to Ha Long Bay is increasing. Most of them are from China, ASEAN countries and Korea, but I don't see any significant improvement in other markets. We also seem to have more customers from the high-end market who are willing to pay more. Most Chinese tourists come and stay in hotels on land, and then take a day cruise. There are many more hotels in Ha Long City and Tuan Chau Island to choose from compared to a decade ago. Currently many people still see Ha Long as a cheap destination, and they do not think that there are luxury accommodations or facilities here, even though this is not true. So the average room rate in Ha Long is still low compared to the quality of the hotels and the cruises. Compared to other destinations or other countries, the quality of facilities and services is really good both on water and on land. The length of the stay is increasing for the hotels on land. 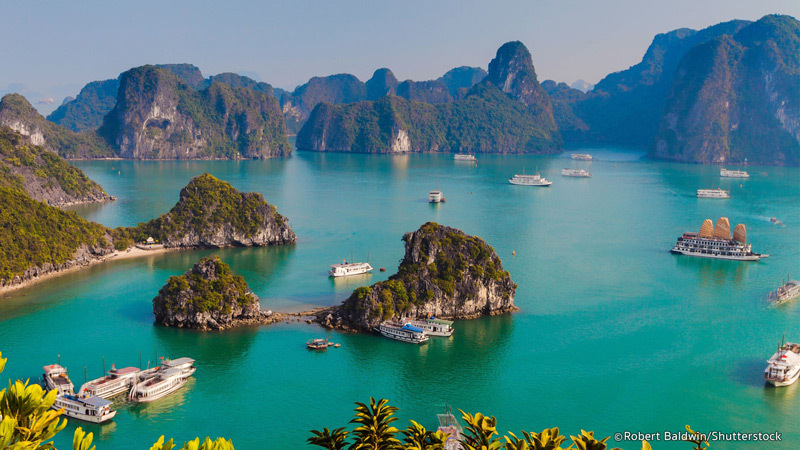 But for the cruise we think that most people still take only one night on the cruise, not because there’s nothing to do in Ha Long Bay (there are more activities being promoted now), but because people have a shorter stay in Vietnam in general. Normally people stay three weeks in Vietnam so they can spend two or three nights in Ha Long Bay. But now they shorten their stay to two weeks or only one week in Vietnam, and in Ha Long they can only stay one night. There are enough activities in Ha Long to keep people entertained for a few days. If you just want to relax, you can take longer cruise of two or three days, or even longer on a chartered cruise to explore the bay in full, enjoy the beautiful little-known beaches and caves. If the weather allows, you can also spend a day cycling around villages on Cat Ba Island. For people staying on land, especially families with kids, there is the new Sun World Ha Long amusement park launched by Sun Group. You can also explore Ha Long City, its markets and streets to know more about local culture and cuisine. Ha Long welcomes a lot of Hanoi residents during summer weekends as it is one of the nearest beaches to the capital. By the end of June 2018, the new highway connecting Hanoi, Hai Phong and Ha Long will be finished, and it will take only one-and-a-half hours from Hanoi to Ha Long, instead of three-and-a-half hours at the moment.